It’s been far too long since I’ve posted around here! Sorry for leaving you in the lurch, dear readers. I hope this delicious bowl of mussels makes up for my absence. About a month ago, things got real busy around here. My workload increased by about 50%, leaving a lot less brain space for personal projects. Now that I’m adjusting to the extra hours, though, I’m itching to do more blogging, share more recipes (I am still cooking, after all! ), and drop by this space more often. Back in May and June, I wrote a few posts about doing the Whole30 diet. It’s been three months since I completed the 30-day program, and I am still incorporating lots of the habits I picked up while eating Whole30 style. I’m eating more vegetables and less sweets, and I’ve also quit drinking caffeinated coffee. On the flip side, I have reintroduced pretty much every food that was a no-no on the restrictive elimination diet regimen. This doesn’t equate to “going off the wagon,” quitting, or any other sort of diet failure. The point is not to stay strict with your food choices forever. It’s to see what works for you, what doesn’t make you feel so great, and to help you find balance in the way you approach food. I’m back to eating dairy, having a sip of beer or a glass of wine once in a while, and eating a serving of grains if I feel like it (though usually not more than once a day). Whenever I eat a large amount of starchy vegetables, grains, or grain-based products (especially when paired with anything sugary), I regret it. My blood sugar spikes, my anxiety increases, and then I’ve got to ride it out for a few hours. And then for a day or so afterward, I’ve got a headache. No good! You know what was good though? This gorgeous Annieglass bowl full of equally gorgeous cove mussels, harvested by Kirk Lombard a.k.a. the Sea Forager. Subscribe to his Community Supported Fishery and you get crazy-fresh fish and seafood every week delivered to a pick-up site near your home in the SF Bay Area. My husband and I subscribed a couple months ago, and we’ve loved everything we’ve gotten. The two pound bag of mussels has been our favorite score so far. They were just plain delicious, and also encouraged us to get together in the kitchen and prep dinner together, something that doesn’t happen too often. While Brendan carefully scrubbed off the little mussel beards, I rendered a few slices of not-too-smoky bacon from Belcampo Meats in a big ol’ pot. After pouring off the bacon fat, I added a little butter, garlic, diced tomato, and salt. 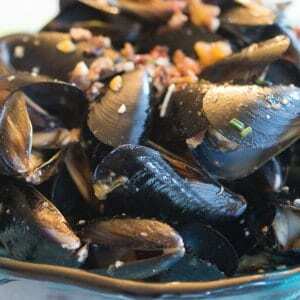 This aromatic mixture provided the flavor base for the mussels’ steaming liquid. Next, in went a squeeze of lemon juice and a good glug of Dry Creek Chenin Blanc, a dry white wine. Any crisp, steel cask-fermented white wine would work well — just make sure it’s one you’ll want to drink with your dinner. 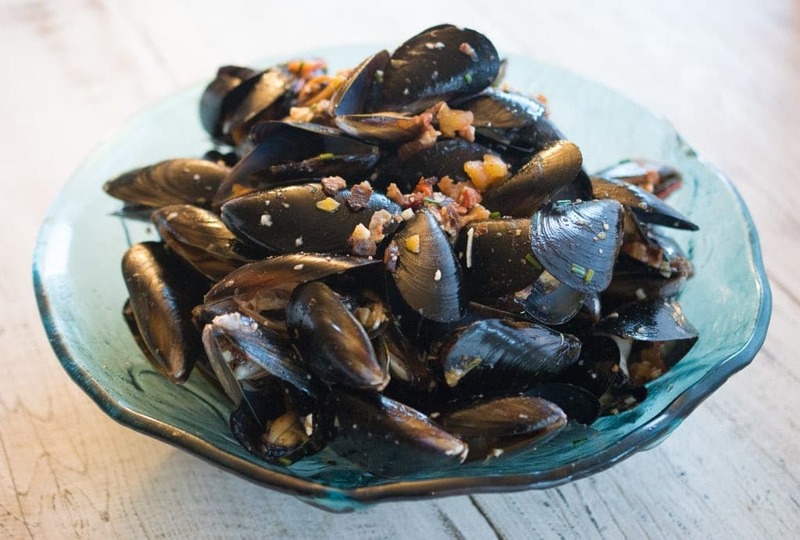 Once the steaming liquid came up to a boil and reduced a bit, we poured those mussels into the pot, stirred them up to coat with all of that bacon-y, tomato-y liquid, then closed the pot and let the mussels steam to kick-start the steaming process. Three minutes later, I removed the lid from the pot. The first few mussels had just started opening, and the rest weren’t far behind. 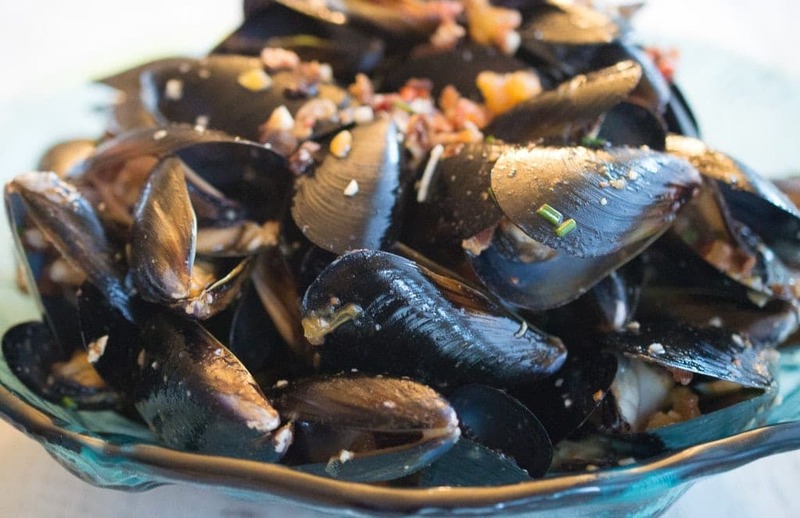 As they opened up, we transferred them to the serving bowl with a pair of tongs, reduced the steaming liquid down to a flavorful sauce, then tossed the mussels in the liquid once more, along with the bacon and a handful of chopped chives. We served our mussels with oven-baked fries (those went in the oven at the outset of prepping dinner), but they’d also be delicious with crusty bread alongside, perfect for sopping up the sauce. We’ll definitely have to make these again while it’s still warm out. Right now is the perfect time to cook up a big pot of shellfish and enjoy the last couple weeks of summer — it’s not officially fall until September 23rd, after all! Mussels steam in minutes in a light, tomato and bacon-flecked white wine broth. In a large (8 to 10-quart) pot, render the bacon over medium low heat until it is crispy, about ten minutes. Remove the bacon to a paper towel-lined plate and discard the bacon fat or save it for another use. Place the pot back over medium low heat, then add the butter and garlic and sauté until the garlic has softened and become aromatic but not brown, about three minutes. Add the diced tomato and salt, and sauté for another five minutes. Add the lemon juice and wine and raise the heat to medium, bringing the mixture up to a strong simmer. Let it reduce by about 1/3. Add the mussels to the pot, stirring to coat with the steaming liquid. 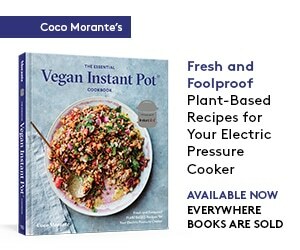 Turn the heat up to high, cover the pot, and leave it covered for three minutes. 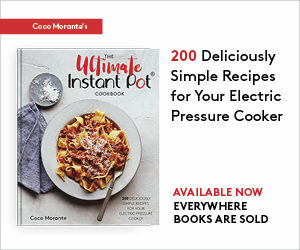 Open the lid of the pot. Use a pair of tongs to transfer mussels to a large serving bowl as they open. Once you've removed all the mussels from the pot, reduce the cooking liquid by half. Turn off the heat. Return the mussels to the pot, crumble in the bacon and sprinkle in the chopped chives, then stir everything up to coat the mussels evenly. Pour the mussels and broth back into the serving bowl and serve hot, with fries or crusty bread alongside. When you buy mussels, look for tightly-closed specimens. Store them on ice in your refrigerator until ready to clean and cook. Discard any mussels that are cracked or open. Do not serve any mussels that have not opened while cooking.